Three countries in the Middle East and Africa is in need of hardworking and dedicated Filipino workers in different fields. Many construction workers are in need in Egypt. The country is particularly hiring for foreman, technicians, welders, ironworkers, and many others. Meanwhile, Jordan is in need of housemaid, cook, nurses, etc.. Morocco is in need of household service workers, engineers, technicians and many others. 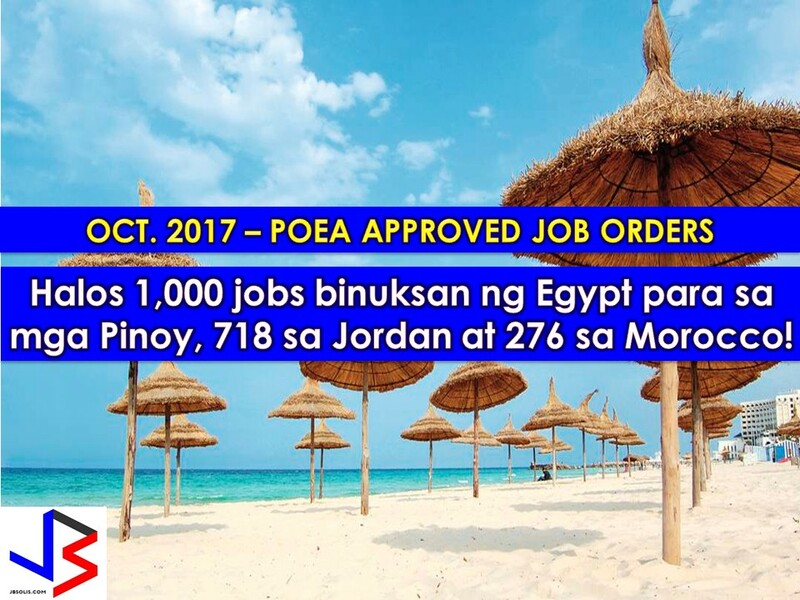 The following are a complete list of job orders approved by Philippine Overseas Employment Administration (POEA) for the month of October 2017. Please be reminded that we are not recruitment agencies and all information in this article is taken from POEA website for general information and purposes only. Recruitment agencies information are linked to every job listed below. DISCLAIMER: Any transaction entered in any of the following recruitment agencies is at own risk and account of an applicant.